What type of coin collector are you? What category of collectors do you fall into? Type collectors are people who collect one example of every coin, design, denomination, or metal from a certain period of time. This means is that type collectors focus less on having every single date-and-mintmark combination from a coin series. They often spend their time trying to get representative examples of coins that belong to a certain time period instead. 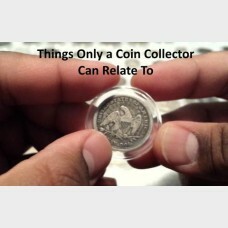 Of course, we also have the a large fan base of Novelty coin collectors. They collect coins that are usually real, but they did not get struck at the Mint looking the way they now do. Instead, many companies, private individuals, and others have modified or altered the appearance of those coins to honor a special occasion, event, person, or place. And, we have the Investment collectors which are the Bullion coin collectors who pay careful attention to the value trends of the bullion coins they are buying because the prices for some fluctuate as quickly as the prices for stock shares. Do you appreciate coins based upon the kind of image they have on them, then you may be a topical coin collector. That is, you collect coins because they have designs of certain subjects you like. For instance, a bird coin or an island coin are good examples. And, we do have Modern U.S. Coin Collectors who basically means collectors who generally pursue coins like: Lincoln cents, Buffalo nickels, Mercury Dimes, Walking Liberty half dollars, Franklin half Dollar, Indian Head pennies, Barber Coins and other coins well associated with the 20th Century. Lastly, the Rare Coin collector are those who chase after the scarcest, often priciest coins ever made. Rare coin collectors are among the breed of hobbyist that may spend a weekend at a coin auction ready to spend thousands of dollars on the most sought-after coins that reach the block. Come visit the London Coin Galleries of Mission Viejo and you'll be amazed at our coin collections no matter what type of collector you may be. 1 William S. Cahill (Florida Atlantic University) in 1986: Intelligence and Compulsive Personality Traits as Mediators in the Contribution of the Colleting Hobbies to Academic Achievement for Eighth and Ninth Grade Students, PhD thesis.